As mentioned last time, the National Grange has sent out its annual Bonding request for 2019. Letters with the forms and specifics about the program will be out in the Granges by the time you are reading this. PLEASE return your bonding payment and form to me at the Central Office as soon as you can but no later than the deadline listed in the letter. 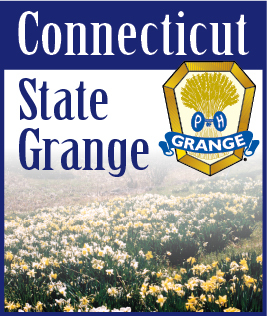 As I have said many times, the Connecticut State Grange pays for every Grange regardless of whether or not we have received your payment or not. It’s a considerable amount of money to pay all at once, so your prompt payment is sincerely appreciated. The numbers are much smaller, but we still have Granges who have not submitted Directory information for 2019. All have been notified and we will have to proceed without them. It’s a shame to spend so much on printing the State Directory knowing there Granges listed with outdated information. The Directors have been working hard and most of the necessary information has been received to print the Blue Book. We will have both publications out to you soon. In the meantime, with the Bonding letter, Granges will be receiving a copy of the 2019 Legislative Policy Guide and a copy of the 2018 Journal of Proceedings (if they weren’t picked up at State Session). The State Master mentions Leaders Conference in his column, and I want to direct your attention to the registration form printed at right. The conference is open to ALL MEMBERS and we strongly encourage all Granges to have a representative at the conference. It will be held at the Holiday Inn Norwich, where the State Grange has now met for several years. The room rates are the same as State Session and the meals will be just as great as they were in October. On Saturday morning we are also offering a Continental Breakfast for $12.00 along with a buffet lunch and buffet banquet. The conference will feature speakers and possible workshops. We are in the process of finalizing the content of the conference so a complete schedule will be made available to all Granges and in the CT Granger when available. Stay tuned!